Sometime you just want to tweak an image and move on... fast. At that moment, you don’t want commitment (iPhoto, Aperture, and Lightroom), or a bizillion editing options (Photoshop), you just want to brighten the picture, adjust the color, crop it, and be done. We have great news for you. This application exists, it’s free, and it’s already on your Mac. It’s called Preview. Many Mac users prefer using Preview for working with PDFs because of its clean interface and no-nonsense set of tools. What may surprise you, however, is that this application also has a robust set of imaging tools. I’m not just talking about double-clicking on a photo and looking at it on your computer. Beyond that, you can adjust an image’s tonality, color, and even select objects within the shot to copy and add to other photographs. To prove my point, I’m going to take you on a quick photographer’s tour of this handy imaging application. A good way to get a feel for the functions available in Preview is to customize the top toolbar. Go to View -> Customize Toolbar, and you’ll see icons for zooming, selecting, cropping, rotating, and even scaling. 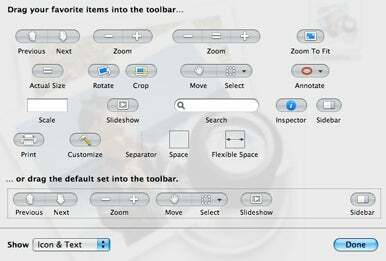 Drag the tools you will use the most often to the top toolbar so they’re ready when you need them. Next, go to Preferences (Preview -> Preferences), click on the General tab, and click on the radio button next to “Open groups of files in the same window.” This allows you to work on multiple images at once in Preview. Test this by selecting a handful of pictures and dropping them on the Preview icon. You’ll get a column of thumbnails displayed in the sidebar with one image featured in the main window. You can navigate the thumbnails by clicking on them individually, or by using the up and down arrow keys. If you want to add another picture to the line up, just drag it to the sidebar and let go. Right-click or Control-click in the sidebar and you’ll be presented with options for sorting the thumbnails or choosing how many columns you want them displayed in. If you don’t like the default sorting options, choose None from the contextual menu and you can drag the thumbnails in any order you want. Batch resampling two images by selecting them both in the Preview sidebar. 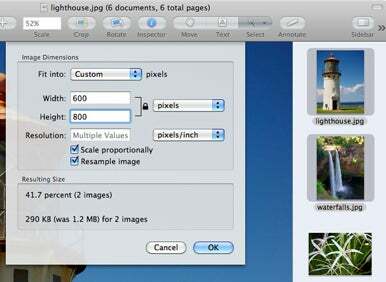 You can also perform basic batch processing on multiple images with Preview. Command-click on two or more thumbnails in the sidebar, then apply the rotate command. You’ll probably want to use the Rotate button in your top toolbar, but if it isn’t there, then go to Tools -> Rotate Left or Rotate Right. The rotation will be applied to all of the selected images in the sidebar. Bonus tip! If you do use the Rotate button, you can reverse its direction on the fly by holding down the Option button. Maybe your images are too big and you want to sample them down. Command-click on the thumbnails of the images you want to resample, then go to Tools -> Adjust Size, and choose the new dimensions that you want to use for the photos. Preview will resample all selected images. How’s that for efficiency? Preview's Adjust settings when turning a color photograph into a black and white image. Most photographs could use a little tonal or color adjustment, and sure enough, Preview handles those enhancements just fine. Bring up the adjustment inspector by holding down Option-Command-C, or going to Tools -> Adjust Color. You’ll be presented with eight individual controls to help you improve your photograph. iPhoto has these tools too, so you may already be familiar with how to use them. Start by clicking on the Auto Levels button right below the histogram. More often than not, this will give you an immediate improvement. 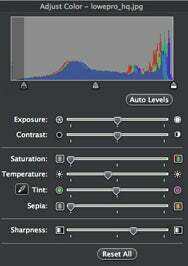 Fine-tune the tonal adjustment by moving the three triangle pointers beneath the histogram. The left one is for dark tones, the right is for highlights, and you’ve guessed it, the middle pointer is for midtones. Now let’s correct the color. Click on the eyedropper icon beneath Temperature. This allows you to auto correct color by then clicking on a white or gray area in the picture. If you want to fine tune this adjustment, use the individual Temperature and Tint sliders. In most cases, Temperature is the more useful of the two, allowing you to warm up (slide to the right) or cool down (slide to the left) you images. If you want to convert and image to black and white, move the Saturation slider all the way to the left. You can color tone the image by playing with the Temperature, Tint, and Sepia sliders. This once required lots of work in the chemical darkroom. Now it’s just plain Mac fun. Finally, you can add a little sharpening to the picture via the Sharpness slider. Be careful not to overdo it here, or you might introduce unsightly artifacts. Move the slider to the right about halfway between the midpoint and the right endpoint. That should suffice in most cases. You can also soften the image by moving the slider to the left. This creates a dreamy effect that can enhance moody landscapes. Here’s a little Photoshop-like goodness that should delight editors of all levels. You can select an object in a photo and isolate it using the Smart Lasso tool. Click on the Select icon in the top toolbar, then choose Smart Lasso from the popup menu. Carefully outline the object you want to isolate with the Lasso. When you let go of the mouse button, Preview will fine tune the selection for you and display “marching ants” around the object. To isolate it, go to Edit -> Invert Selection. Then hit the Delete key. Boom, your background is gone. For more creative projects, you can also copy and paste these smart selections into other images. When you have the marching ants around the first object you selected, hit Command-C to copy it. Then go to the image you want to add it to. Use another selection tool, such as Elliptical Selection, to indicate the area in the new photograph you want to add the copied object. Once you have the marching ants visible in the new location, press Command-V to paste the object into that area. You can even move it around once you’ve pasted it. There are even more goodies for photographers in Preview that we’ll share next time, but these tips should get you well on your way to exploring this powerfully simple application.